The Canadian Real Estate Association says home sales in September fell 0.4 per cent compared with August, but average prices are still up slightly compared to this time last year. The Canadian Real Estate Association says home sales in September fell 0.4 per cent compared with August. The association says it was the first month-over-month decline since April. Sales fell in slightly more than half of all local markets, led by Vancouver Island and Edmonton, along with several markets in Ontario's Greater Golden Horseshoe region. The move lower came as home sales compared with a year ago fell 8.9 per cent. The national average price for a home sold in September was just under $487,000, up 0.2 per cent compared with a year ago. Excluding the Greater Toronto Area and Greater Vancouver Area, the average price was just over $383,000. The news comes on the heals of Canadian Mortgage and Housing Corp. data that showed housing starts fell to their lowest level in nearly two years in September. The seasonally adjusted annual rate came in at 188,683 units last month, down from 198,843 in August. 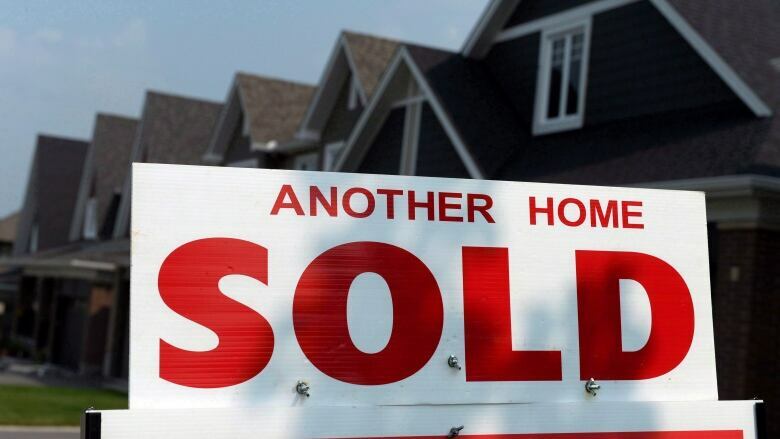 Rishi Sondhi, an economist with TD Bank Group, said in an email to CBC that sales posted relatively solid gains in June and July, driven by a rush of pent-up demand as markets adjusted to the updated lending guidelines. "However, activity has eased considerably since then. This is consistent with our forecast calling for resale activity to rise at a more moderate pace in coming quarters, as increasing borrowing costs and stretched affordability conditions in key markets keep a lid on demand."